"The office tower, one of Latin America’s tallest skyscrapers, was meant to be an emblem of Venezuela’s entrepreneurial mettle. But that era is gone. Now, with more than 2,500 squatters making it their home, the building symbolizes something else entirely in this city’s center. The squatters live in the uncompleted high-rise, which lacks several basic amenities like an elevator. 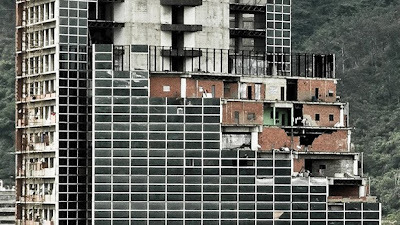 [...] Once one of Latin America’s most developed cities, Caracas now grapples with an acute housing shortage. [...] Private construction of housing here has virtually ground to a halt because of fears of government expropriation. The government, hobbled by inefficiency, has built little housing of its own for the poor. [But] strivers abound in the skyscraper. They chafe at being called “invaders,” the term here for squatters, preferring the less contentious word “neighbor.” A beauty salon operates on one floor. On another, an unlicensed dentist applies the brightly colored braces that are the rage in Caracas street fashion. Almost every floor has a small bodega. [...] “There’s opportunity in this tower." Also check out Torre David documentary trailer... Caleb's asking the fascinating question "What if we built such towers intentionally with adequate but affordable infrastructure and amenities?" Addendum: AmusingPlanet's Kaushik revisits Torre David.